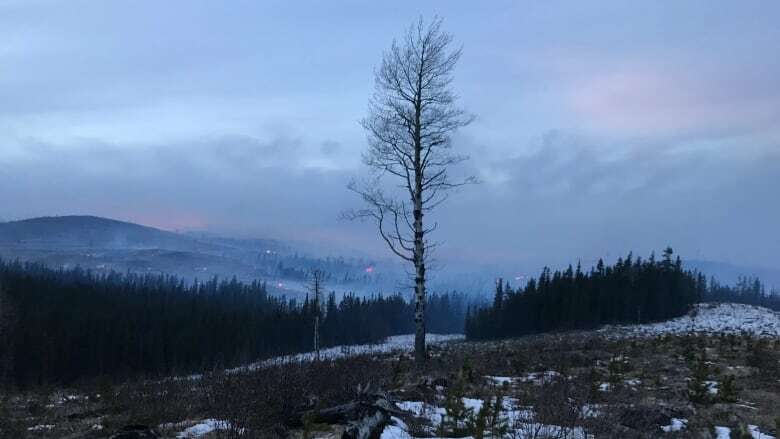 A December wildfire that was whipped out of control and threatened the evacuation of some Alberta communities this weekend isn't as out-of-season as it might seem. "Every year, we see some fires in the wintertime. This one just garnered a little bit more attention than they normally do," Melissa Story, a provincial information officer with Alberta Agriculture and Forestry, told CBC News on Saturday. There were two fires discovered Friday afternoon in the area about 75 kilometres southwest of Edson, Alta. One was very small — only about 500-square-metres big — but the second, fanned by wind gusts up to 110 km/h, rapidly grew in size to about 100 hectares. It was located between the communities of Cadomin and Mercoal in Yellowhead County. "The conditions that we saw yesterday with the heavier winds definitely gave that fire a bit of a run but we have it under control now," she said. There is also less snow in the area than is normal, another factor in the blaze's quick growth. It was brought under control at about 11:30 a.m. Saturday. Story said a change in weather conditions on Saturday morning, including some light snow and reduced wind speeds, were a big help to firefighters in getting the upper hand. Residents in the hamlets of Mercoal and nearby Robb were put on notice that they may need to evacuate on Friday. The advisory was lifted on Saturday. The cause of the fire is under investigation, but Story said it is almost assuredly related to human activity. "We don't normally get a lightning storm in the middle of winter," she said. "It would have been a human cause, we just can't determine what the cause is at this time." According to the 2018 wildfire statistics for Alberta, 60 per cent of the year's 1,288 wildfires were caused by humans, with the remainder started by lightning. The total number of wildfires in 2018 was slightly lower than the five-year average of 1,414. The total number of hectares burned in 2018 was just short of 60,000 — significantly lower than the five-year average of 235,000 hectares. Story said it's important for people to be conscious of fire safety throughout the year. "Wildfire safety is a big thing," she said. "So if you are having a fire, even in the winter months, make sure you are soaking it, stirring it and soaking it again."